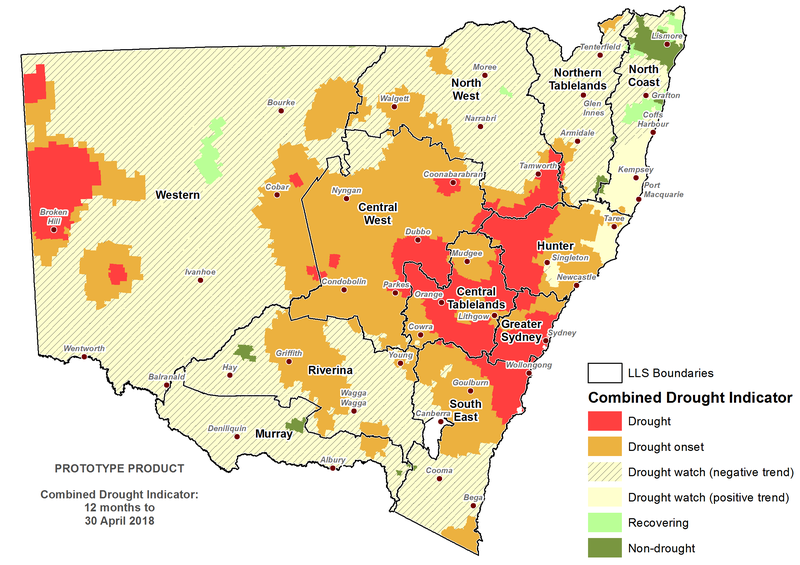 NSW is currently experiencing widespread drought conditions. Approximately 61% of the state is in the Drought Watch category, 27% in Drought Onset and 9% in Drought. The dry seasonal conditions that were reported in March have further deteriorated in April, with the vast majority of the agricultural production zone now in mild to severe Drought. The key driver of these conditions is a wide spread soil moisture deficit, resulting in very low values for the agronomic indicators. This is evident in field conditions including minimal pasture availability, deteriorating ground cover and limited sowing opportunities in cropping areas. Isolated areas along the North Coast have experienced average rainfall and are in the Non-Drought category. Other parts of the state have experienced some minor falls of rain which have been largely ineffective for agricultural production. The soil moisture deficit affects a large proportion of the winter cereal growing region. Sowing opportunities are now limited in most areas, or producers are implementing a higher risk dry sowing strategy with no stored soil moisture. Without a dramatic improvement in rainfall conditions during early May, DPI would expect official crop forecast yields to be revised down for 2018. Indicator data from the Enhanced Drought Information System (EDIS) establishes that a number of regions are further into a drought cycle compared to the rest of the state. These include parts of the Hunter, Central West, Central Tablelands, Greater Sydney, South East, Western and North West Local Land Services regions. Drought indicators are falling rapidly and the proportion of the state in Drought and Drought Onset is expanding. 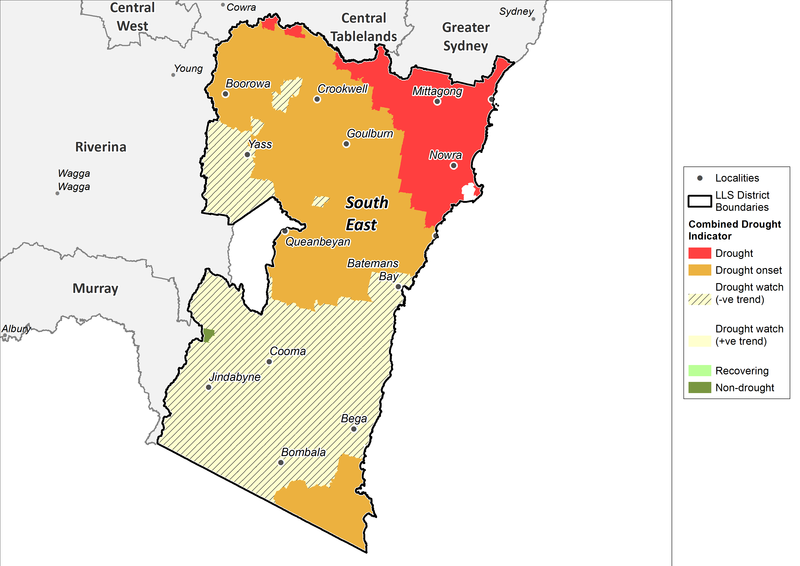 There are also areas in the Western, North West and Northern Tablelands that are currently in Drought Watch, but are very close to Drought Onset. The climate monitoring network in these areas has low density, and comparison with satellite data indicates that rainfall observations may not capture the full level of variation currently being experienced farm-by-farm in this part of the State. Summer rainfall has been highly variable, and the corresponding pattern of on-ground agronomic conditions in these areas is complex. The intensification of dry conditions during April have been a result of minimal falls of rain across most of the State, and higher than average temperatures for the month. This is the result of a warm airflow across the NSW, originating from the north-west and central Australia. It is important to recognise the CDI provides an aggregated view of the State, and that on-ground conditions can be different to those displayed in the maps. They provide an ‘on average’ view of a particular region only. Changes in the CDI may have occurred since this update was released. For the most current information, please visit the interactive website via DroughtHub. 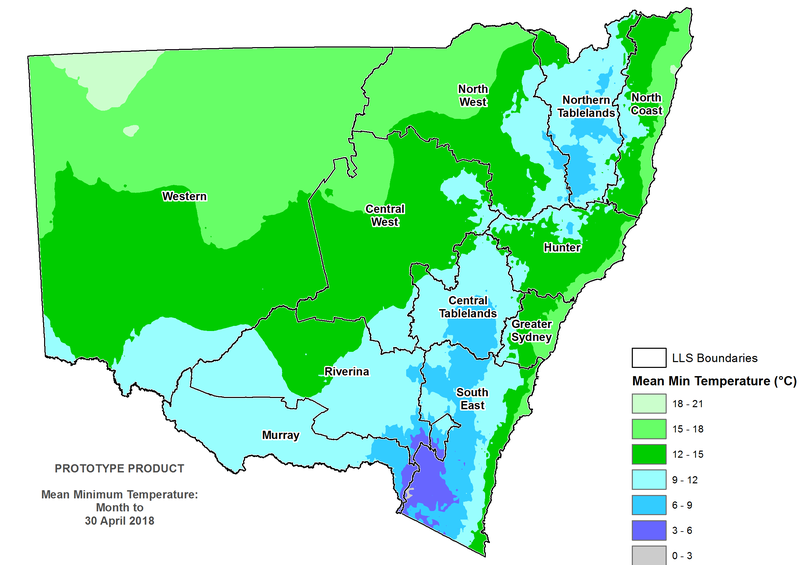 Rainfall totals were below average across the majority of NSW during April, although heavy falls did occur in areas of the north-east Hunter and North Coast (Figure 2). Rainfall ranged from 0 to 25mm across most of the state and totals increased towards the east. Large areas of Western, Central West, Riverina and Murray Local Land Services regions received rainfall of less than 10 mm. The monthly NDVI anomaly data indicates that lower than normal greenness extended across the majority of NSW during April (Figure 3). 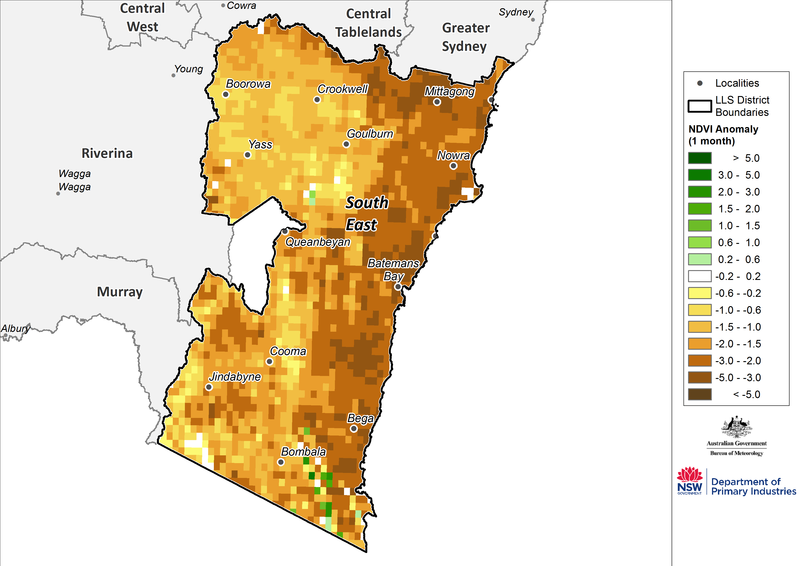 Significantly lower than normal greenness was evident across the Hunter, Greater Sydney, South East, Central Tablelands, North West, Central West and Western Local Land Services regions. All regions show a decline in level of greenness since March. These values are indicative of very poor agronomic conditions across large areas of the state including the potential for heightened erosion risk due to low groundcover levels. For livestock producers the timing of destocking is a critical decision to underpin agronomic recovery in the future. The data available for April at present indicates that temperatures were warmer than average across NSW during April. Most of inland NSW had average daytime temperatures of over 27°C, while in eastern NSW temperatures ranged from 12-27°C (Figure 4). Average overnight temperatures ranged between 9-21°C across most of NSW (Figure 5). Parts of the Northern Tablelands, Central Tablelands, South East LLS regions, and eastern parts of Riverina and Murray recorded average overnight temperatures of between 6-9°C, with parts of the alpine areas recording average overnight temperatures of between 0-6°C. There is a public commentary that April temperatures are setting new records, and this is plausible. The Bureau of Meteorology will analyse high quality official records over the coming weeks and will provide official statements about official temperatures. Outside the high temperatures and dry conditions for April, there are no other events to note. 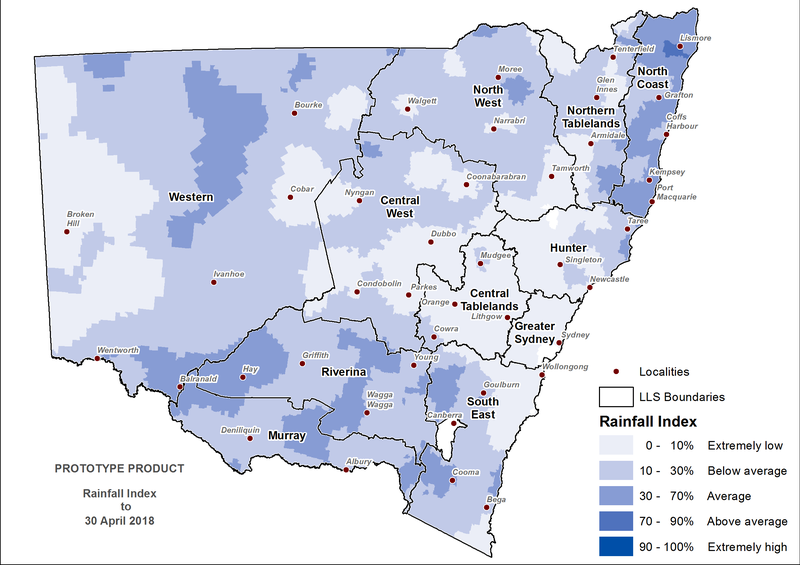 The Rainfall Index (RI, Figure 6) shows below average to extremely low rainfall across the majority of Western, North West, Central West, Central Tablelands, Northern Tablelands, Hunter, Greater Sydney and South East Local Land Services regions. 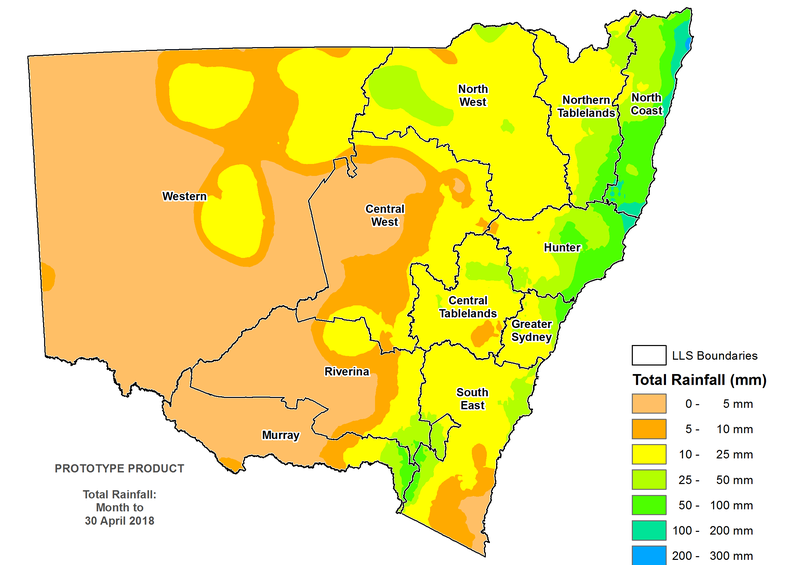 Below average rainfall is also evident across large parts of Murray and Riverina LLS regions. The North Coast LLS region has generally had average rainfall, although parts of North Coast are below average. 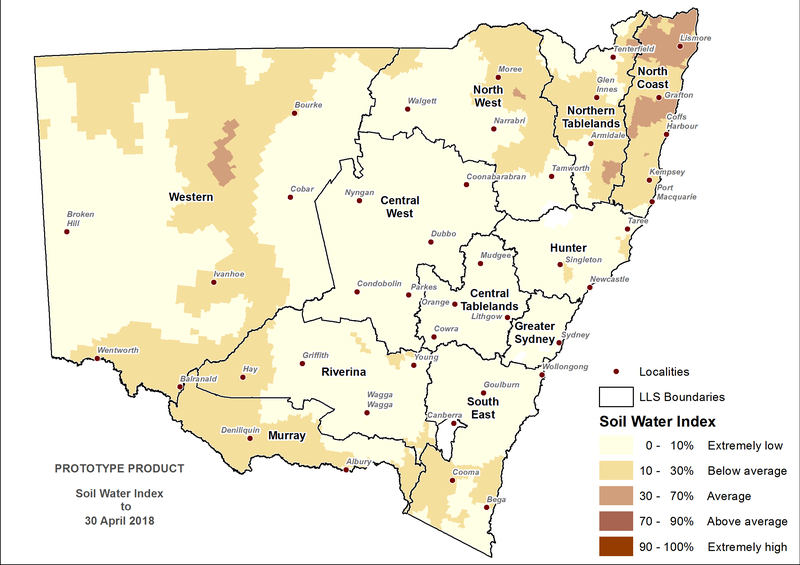 The Soil Water Index (SWI, Figure 7) shows that stored soil moisture is below average to extremely low across the majority of NSW. Isolated areas in Western, North Coast, Northern Tablelands and North West Local Land Services regions have average soil moisture levels. Soil moisture levels are extremely low across most of the cereal growing belt, the exception being isolated areas in Murray, Riverina and North West LLS. 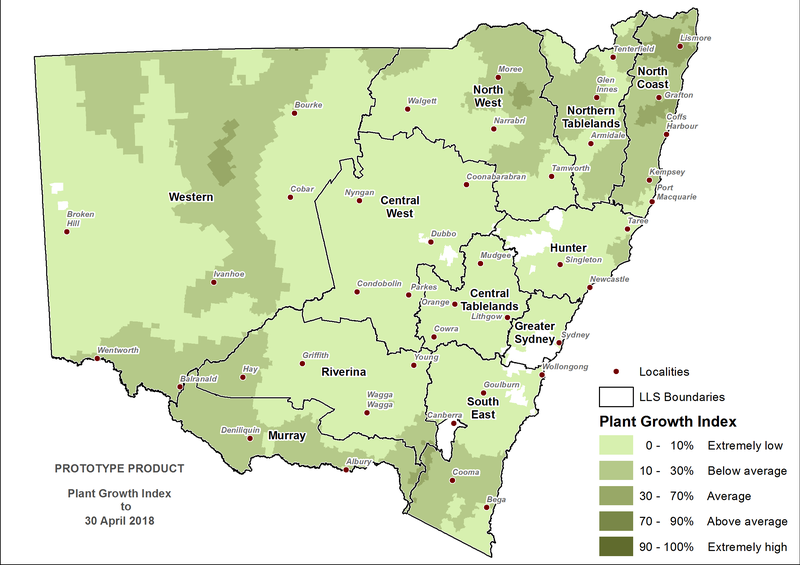 The Plant Growth Index (PGI, Figure 8) is below average to extremely low across the majority of NSW. 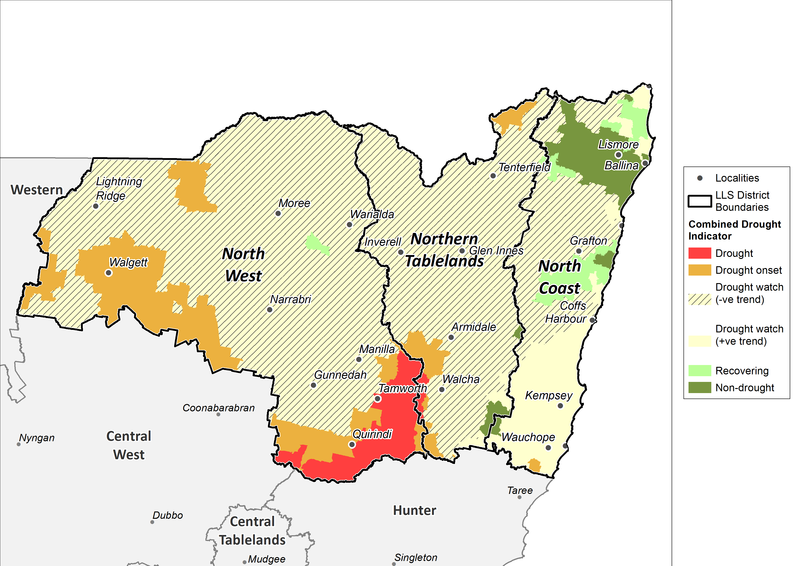 Isolated areas in Western, North Coast, Northern Tablelands and North West Local Land Services regions have average plant growth levels. There is presently a strong relationship between the soil water (SWI) and plant growth (PGI) index in many areas, indicating that dry conditions are limiting agricultural production rather than temperature or radiation. 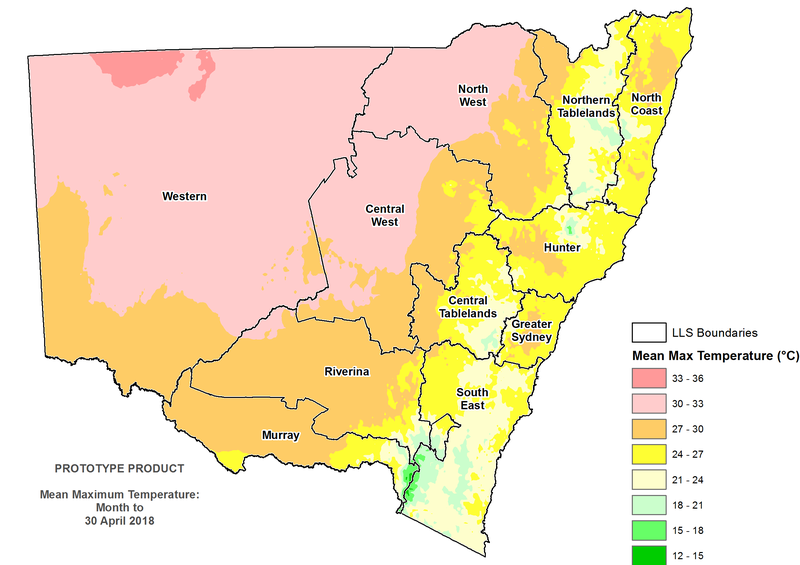 The Drought Direction Index (DDI, Figure 9) to 30 April shows a drier trend across most of NSW. The area showing a wetter trend has contracted to the eastern regions of Hunter, Greater Sydney, Northern Tablelands and the North Coast Local Land Services regions. The DDI reinforces that the State is in a widespread drying event typical of entry into a drought. Changes in the individual drought indicators may have occurred since this update was released. For the most current information, please visit DroughtHub. 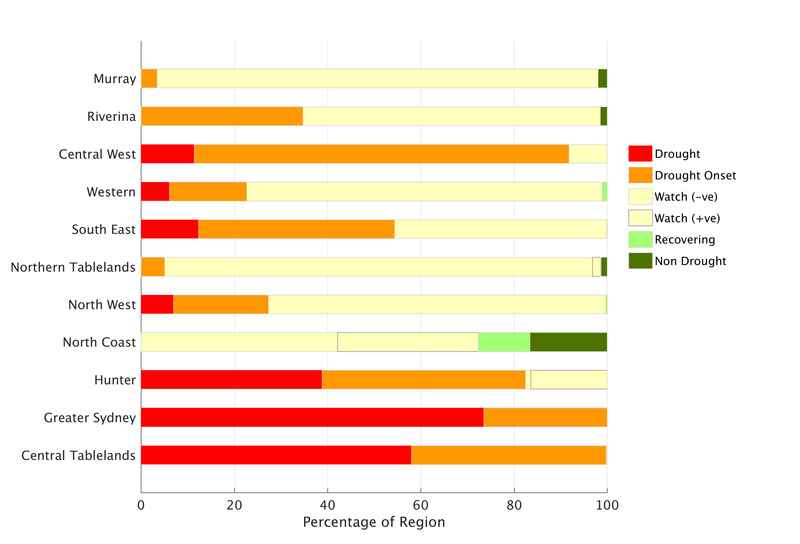 Figure 10 displays the CDI status for each individual Local Land Services region to 30 April 2018. There has been a shift in conditions across the Murray LLS region in April, where dry and hot weather have lowered soil moisture levels, and the area is now under Drought Watch. This is also the case for the Riverina but conditions appear to be more intense around Narrandera, Yanco and Leeton, which are in Drought Onset. 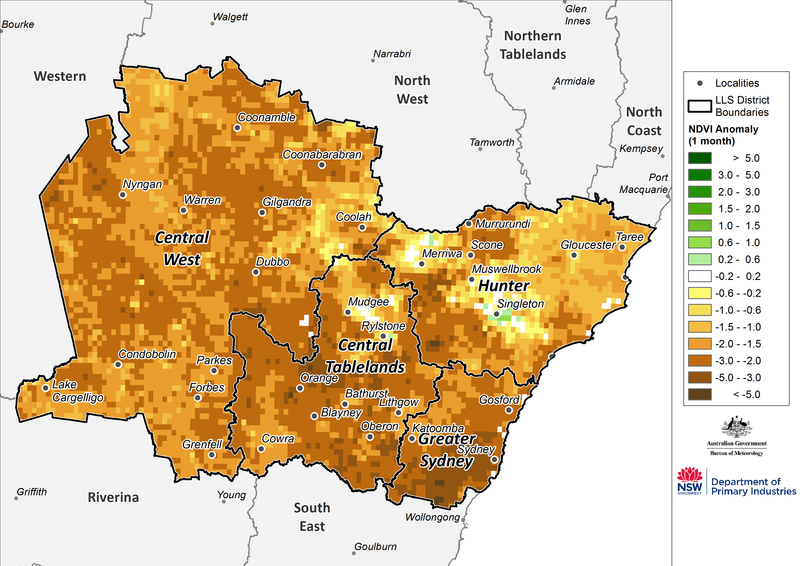 More detailed data shows that soil moisture levels are marginally higher east of Jerilderie and in the far west of both the Murray and Riverina LLS regions. However, because of the low Plant Growth Index these areas have also been categorised in Drought Watch. The monthly NDVI anomaly (Figure 12) indicates a decline in greenness across the regions during April. 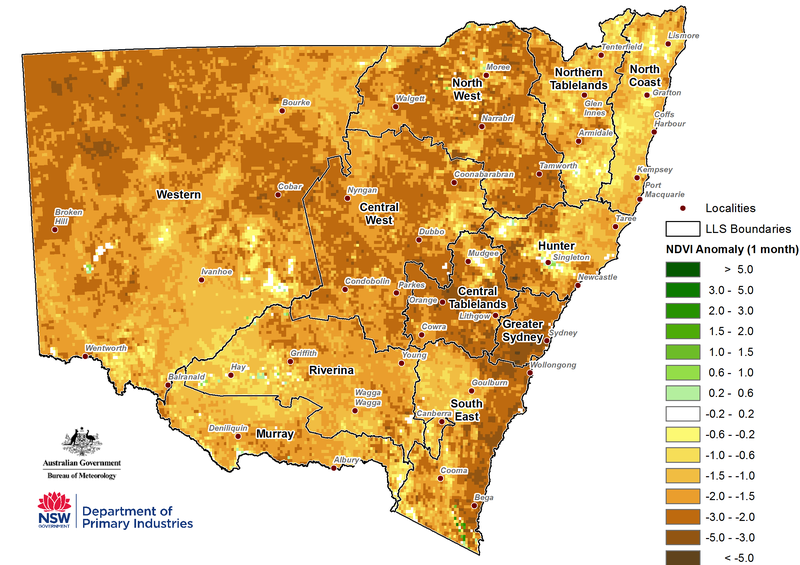 Most of the region has experienced below normal levels of greenness for the month, with areas in the far west, north of Griffith, Narrandera and West Wyalong, and to the east and south of Finley and near Tumut being the most severely impacted. This reflects deteriorating agronomic conditions for land used for pastoral production, and also reflects cropping paddocks where land has been prepared for sowing. Only isolated pockets on above normal levels of greenness are present, including areas near Hillston, south of Deniliquin and to the west of Coleambally and Hay. 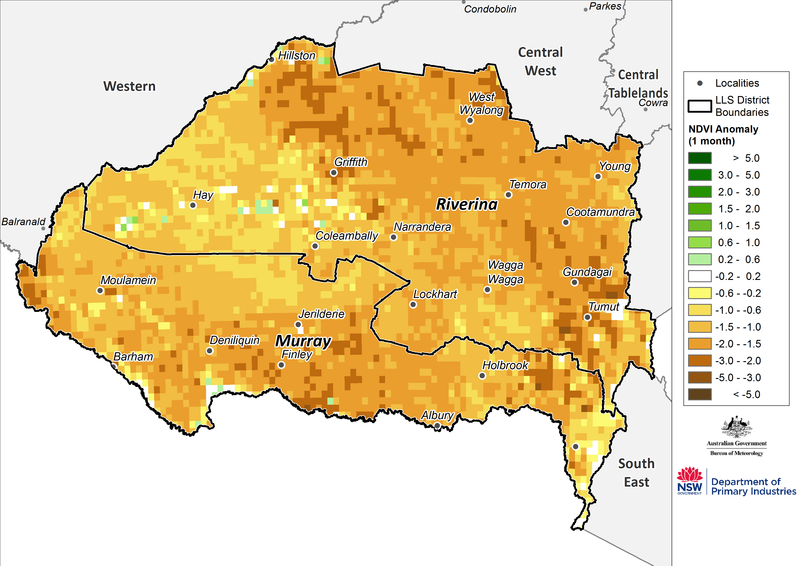 It is important to note that interpretation of the NDVI is difficult for irrigated systems west of Deniliquin, where the data collected by satellite will reflect irrigation rather than soil moisture levels driven by local rainfall. The Combined Drought Indicator (to 30 April 2018; Figure 13) indicates that most of the Western LLS region remained in Drought Watch. The area in Drought has expanded since March, particularly in the far west of the region, and to the north of Broken Hill. Isolated pockets of Drought are also present to the west of Tibooburra, north of Cobar and south of Menindee. 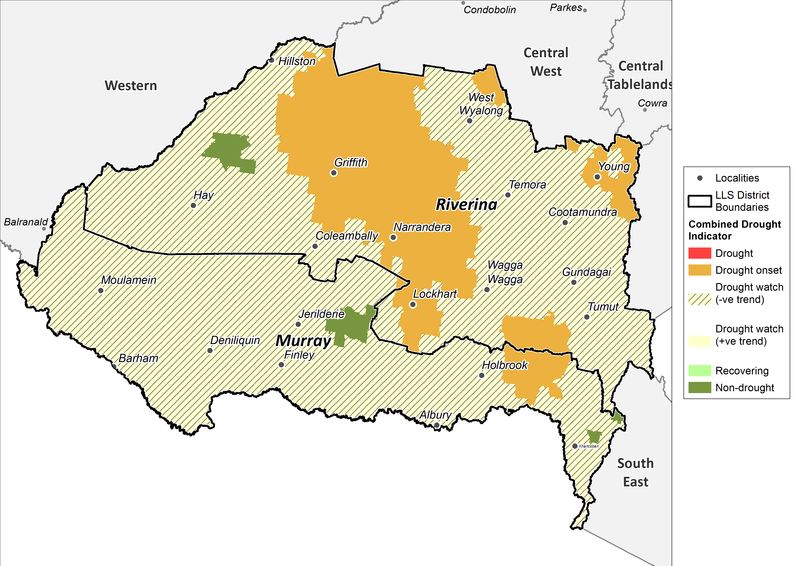 The region classed in Drought Onset has also expanded, now extending to the west of Cobar and Brewarrina. Agronomic conditions are generally poor across a large proportion of the region, with low growth rates and ground cover. There are isolated areas north-east of Ivanhoe that appear to have experienced slightly better soil moisture and agronomic conditions, although these are at a level where this zone falls into drought watch. It is important to recognise that field conditions are highly variable and many parts of the region have been Drought Watch for an extended period of time. Field conditions reflect a combination of the persistently dry state as well as grazing management. The monthly NDVI anomaly (Figure 14) indicates that greenness continues to decline across majority of the Western LLS region, and remained well below normal during April. Areas of slightly above average greenness near Hillston in March have contacted over April. Risks associated with low ground cover, like wind and water erosion, are heightened across much of the region. The Combined Drought Indicator (to 30 April 2018; Figure 15) indicates all of the North West and Northern Tablelands are under Drought Watch, Drought Onset or Drought. 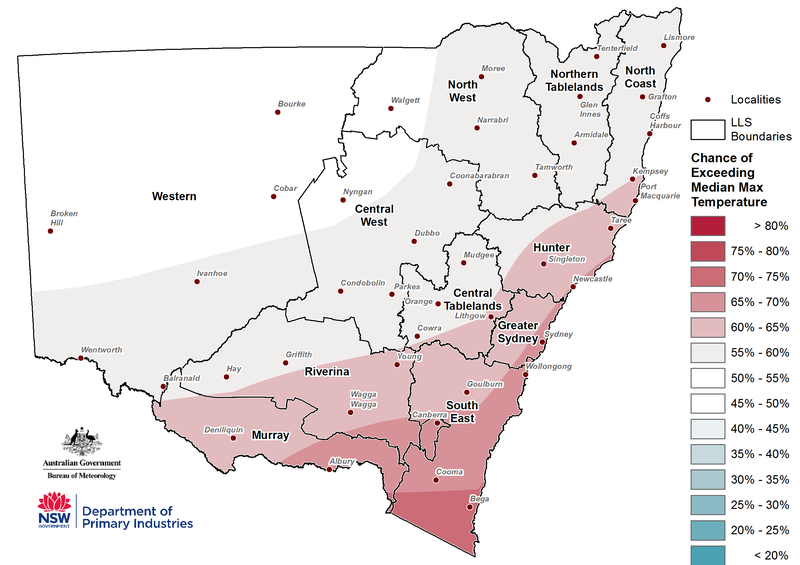 The region around Tamworth to Nundle appears to be the most severely affected and is in the Drought category. The Drought Watch status covers a complex pattern of infield agronomic conditions in these regions. It is apparent that an isolated series of storms have led to higher soil moisture in the area between Bingara and Pallamallawa, in the North West LLS region. Outside of this zone, there is very low soil moisture and NDVI (greenness) values. 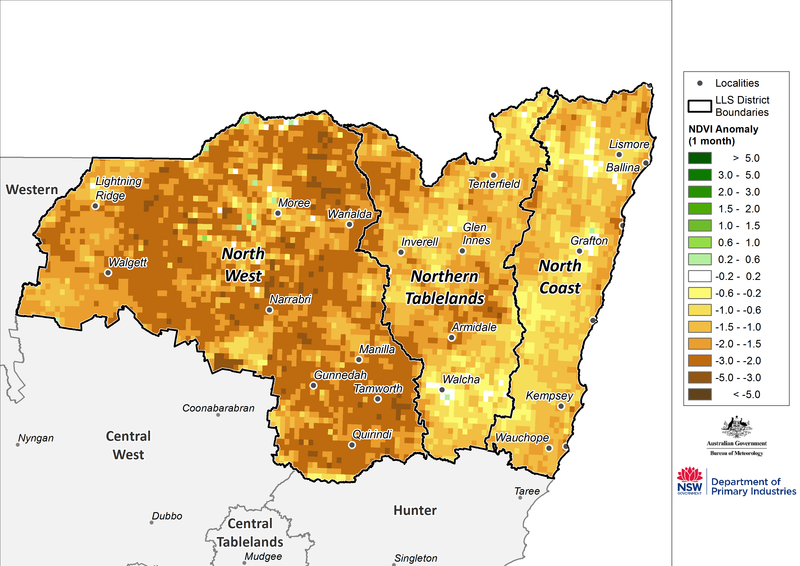 The distribution of conditions in Northern Tablelands is highly complex and is important to recognise that the monitoring network may be insufficient to capture farm to farm variations, particularly to the area west of Glenn Innes towards Bingara. While the area overall is in Drought Watch, some individual farms are likely to be in a more advanced state of drought while others could be experiencing adequate conditions for livestock production. In the North Coast LLS, the region around Casino is in Non-Drought, due to some reasonable rainfall over the past month, but further to the south there is a soil moisture deficit and the area is in Drought Watch. Rainfall during April was largely isolated to the coastal belt. The monthly NDVI anomaly (Figure 16) indicates a decline in greenness across the regions during April. Most of the region is now well below normal levels of greenness. Regions of the North Coast LLS regions that were slightly above average in March have now declined and are now below average. Isolate patches of above average greenness are scattered across the region, though the extent of these areas have declined since March. 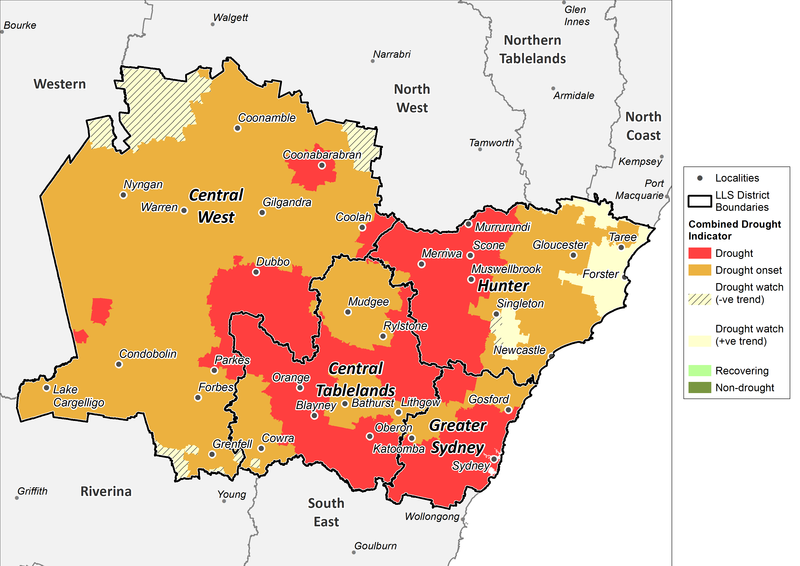 Drought conditions have become more intense and widespread across the Central Tablelands, Central West, Hunter and Greater Sydney Local Land Services regions, and are predominately under Drought Onset or Drought. The north-east region of Hunter experienced a high rainfall event in March but remains under Drought Watch because the agronomic indicators have not responded. 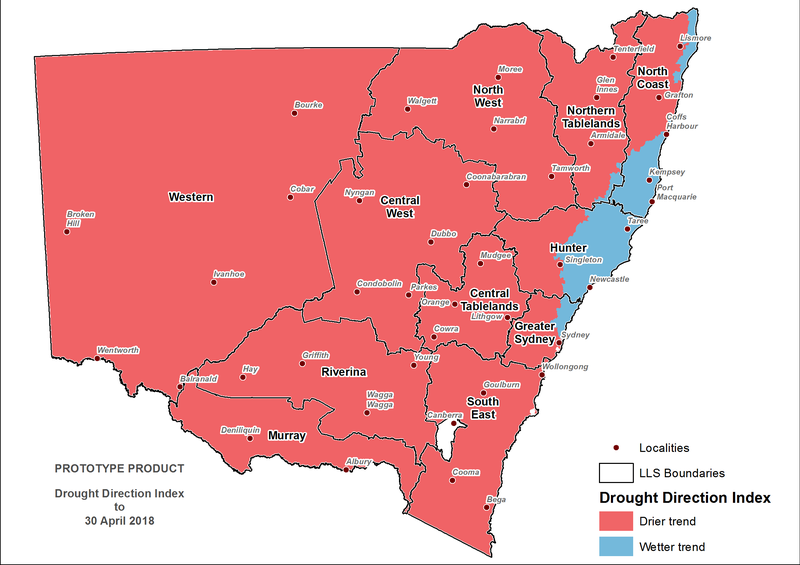 Areas in the west of the Central Tablelands, west Hunter and inner east of the Central West have been in intense Drought for two to three months. It is important to continue to monitor the duration of this event and in particular consider the availability of reserve fodder supplies. The monthly NDVI (Figure 18) anomaly indicates well below normal levels of greenness across the majority of the LLS regions, and conditions since March have continued to deteriorate. The low NDVI values in these regions are indicative of very low pasture availability risks associated with low ground cover, like erosion. 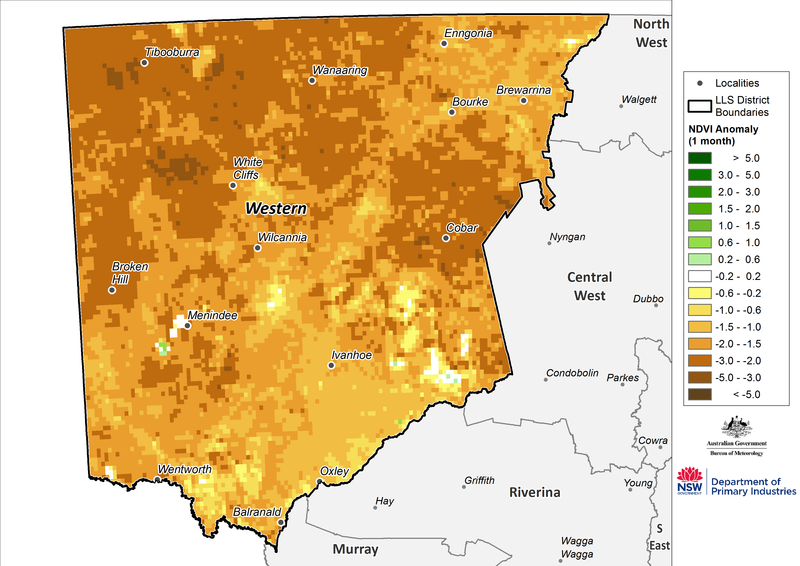 Like most parts of the state there is spatial variability in field conditions with evidence that pastures are in slightly better condition around Dunedoo, but it is unlikely that they would support strong livestock production. Similarly field conditions are in very early stages of recovery around Singleton, but this is coming off a low pasture base and is unlikely to support full production recovery. Conditions have deteriorated in the South East LLS region since March, with the whole region in a drought category. 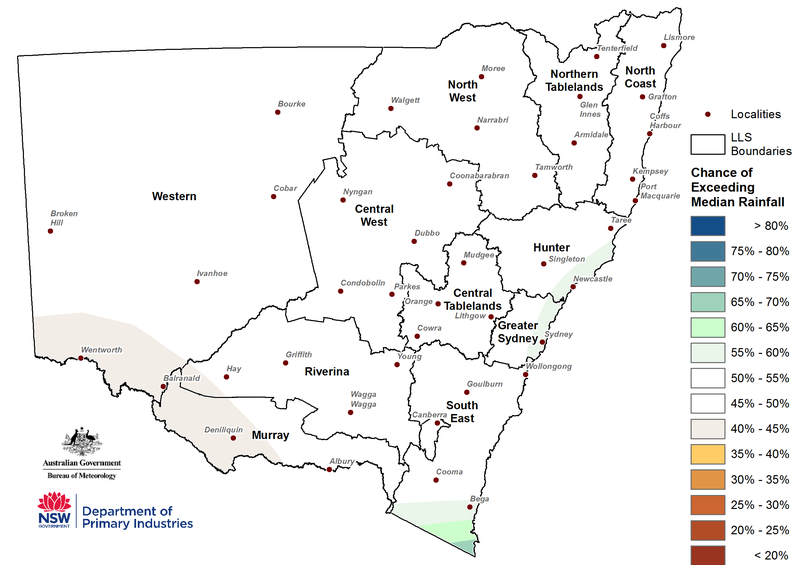 The north-east of the region is in Drought or Drought Onset, while the south to south-west of the region (encompassing the Monaro and alpine zones) are under Drought Watch. The far eastern corner of the district, south of Eden, is in Drought Onset. Field conditions do vary across the region with the pasture growth (PGI) and NDVI suggesting slightly better pasture condition around Crookwell, parts of the Monaro and extending to the coast near Bodalla. Conditions also appear to be better in the alpine zone. Elsewhere pasture conditions are poor. The official national climate outlook for May to July issued by the Bureau of Meteorology on 26 April 2018 shows that parts of southwest Australia and western Victoria are likely to be drier than average over the next three months. Parts of far eastern Victoria, eastern Tasmania and parts of northern Australia are likely to be wetter than average. Elsewhere, there are near-equal chances of a wetter or drier than average three months. May to July daytime temperatures have an increased likelihood of being warmer than average for areas of southern Australia (except for the southwest) and the northern Kimberley in WA. Overnight temperatures have an increased likelihood of being warmer than average for the southern parts of Australia and the northern Kimberley, while eastern Queensland is likely to be cooler than average. For New South Wales, the rainfall outlook (Figure 21) for May to July indicates that there is a near-equal chance of drier or wetter than normal conditions across most of NSW. There is an increased chance of wetter than normal conditions across areas of the far south east of the state. The temperature outlook (Figure 22 & Figure 23) indicates that there is a near-equal chance of cooler or warmer than normal daytime temperatures across the central and western part of the state. 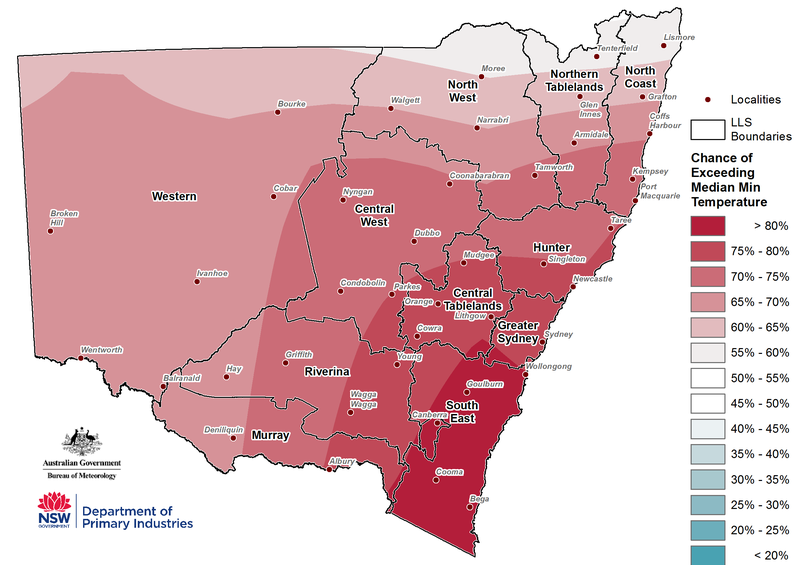 There is an increased likelihood of warmer daytime temperatures across the eastern and south east parts of NSW. Overnight temperatures have an increased likelihood of being warmer than normal across large parts of NSW. The highest likelihood of warmer overnight temperatures is in the south east of the state. Overall, global climate models favour a near-neutral outlook for rainfall for NSW during May to July (Table 1). The temperature outlook is almost equally split between a generally neutral and warmer than normal conditions. Indicators for the El Niño Southern Oscillation (ENSO) remain at neutral (as at 24 April 2018). Most climate models suggest a neutral outlook into winter, with little sign of El Niño or La Niña developing in the coming months. 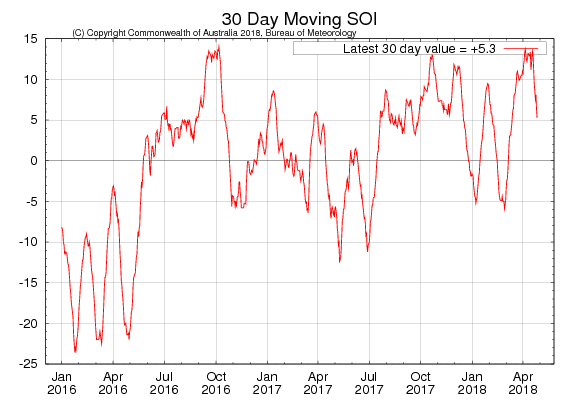 The 30-day SOI value (Figure 24) is currently above normal levels and the 90-day SOI (+4.4) is within the neutral range (the 30-day value was +5.3 as at 30 April). Fluctuation in the SOI is expected to decrease over the winter as the tropical monsoon system breaks down. Cloud levels (as at 24 April) at the junction of the equator and the International Date Line have been below average since late February. Trade winds (as at 24 April) are near average across most of the central Pacific. Monthly sea surface temperatures anomalies (SST, Figure 25) remain cool across the central and eastern equatorial Pacific, although the area of cool water has decreased over the past month, and remains within the Bureau of Meteorology’s neutral range (between -0.8 and +0.8) in the NINO3 and NINO3.4 regions. Temperatures are average to slightly above average in the western equatorial Pacific. A large area of warmer than normal water in the south Pacific extends from the south eastern Australian coastline to New Zealand. However the strength of these anomalies has decrease over the past month. 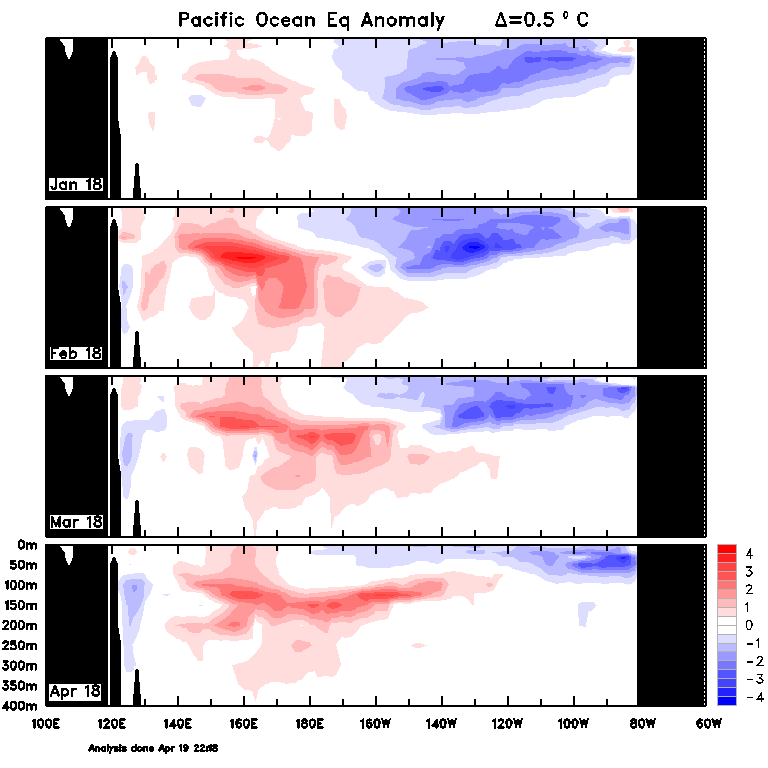 A warm sub-surface anomaly developed in the western equatorial during February, and has moved eastwards over the past few months into the eastern-central Pacific. The passage of the warm anomaly eastwards has greatly decreased the extent of the cool anomaly in the central and eastern Pacific (Figure 26). Despite this, slightly cooler than average sea surface temperatures persist. The Indian Ocean Dipole (IOD) is currently neutral (as at 1 May 2018). There are early indications from some climate models that a negative IOD event might develop during winter, although model predictive skills remains low at this time of year. A negative IOD event increases the chance of above normal rainfall during winter and spring across southern and much of western and central NSW. The Southern Annular Mode (SAM) is currently near neutral (as at 29 April). The outlook is for SAM to remain near neutral to weakly position into mid to late May. It tracks drought by using four indicators; rainfall, soil moisture, plant growth, as well as tracing rainfall trends. Agronomic conditions have equal value to rainfall recorded at meteorological stations. More services from EDIS are scheduled for release over the coming months including a seasonal conditions self-reporting application. Conditions may be very dry, or agronomic production is tight (low soil moisture or plant growth). It is possible to be in drought onset when there has been some modest growth, or a few falls of rain. Conditions are deteriorating; production is beginning to get tighter. Ground cover may be modest, but growth is moderate to low for the time of year. Production conditions are getting tighter, but there have been some falls of rain over the past month. It is rare to enter the Recovering phase from the Non-Drought category; Usually there is a quick (1-2 week) transition into Drought Watch or Drought Onset. The seasonal outlooks presented in this report are obtained from the Australian Bureau of Meteorology and other sources (including World Meteorological Organisation Global Producing Centres). These outlooks are general statements about the likelihood (chance) of (for example) exceeding the median rainfall or minimum or maximum temperatures. Such probability outlooks should not be used as categorical or definitive forecasts, but should be regarded as tools to assist in risk management and decision making. Changes in seasonal outlooks may have occurred since this report was released. Outlook information was up to date as at 3 May 2018. Disclaimer: The information contained in this publication is based on knowledge and understanding at the time of writing (May 2018). However, because of advances in knowledge, users are reminded of the need to ensure that information upon which they rely is up to date and to check currency of the information with the appropriate officer of the Department of Primary Industries or the user’s independent adviser.